It was a few weeks back when we first learned that the iPhone 3G would be available contract free in France, and now retailer FNAC has become the first to begin sales. Of course, as you would expect, the contact free handsets are not in any way inexpensive. The 8GB model is priced at €799 (around $1,123 US) and the 16GB model is priced at €899 (around $1,263 US). It was also noted that France Telecom has appealed the previous decision that made the injunction. In the meantime, if you are in France and have plenty of extra cash on hand, then I suppose you could pick up a contract free iPhone. TUAW is reporting that AroundMe (submitted to the App Store two months ago and approved by Apple) has become one of the highly praised and heavily downloaded apps in the venue. The reasons are because the app does what it's advertised to do, showing you nearby restaurants, hotels, theaters, parking lots, hospitals etc, but mostly because it's free! Best of all, French speaking iPhone users can also download the utility and find out what they've missed out on in their neighborhood, as can German, Portuguese, Swedish, and Japanese handset owners. “AroundMe allows you to quickly find out information about your surroundings. How many times have you found yourself in need of finding the closest Gas Station? [...] Fast, easy and accurate. AroundMe is your ideal day to day companion,” an excerpt from the official iTunes App Store description goes. In the past year or so I’ve made two major purchases. One of these purchases was my new gaming rig which is used everyday when I’m at home. The other purchase was my iPhone which I use everyother place I go whether it be in a long car ride…..or in the back of Trigonometry when our teacher is talking about ‘God knows what’. The point being that I have scoured near every popular free app there is and that is how I make my mark with these, my top 10 free iPhone apps. 10. Remote- This application created by Apple was created to allow an iPhone owner to sync their iPhone with their iTunes library. I find myself using this when I lie in bed not wanting to get up and turn on some tunes from my computer that’ll liven me up and begin the day. Although it is number 10, it is still a good app. 9. Pandora Radio- For those of you who don’t know, Pandora Radio is an online music genome. Meaning that the site owns hundreds of music licenses that allow you the user to pick the style of music you want to hear and the website searching through it’s many databases to acquire you the perfect play list. I strongly recommend this app for long trips so you don’t find yourself searching through staticy stations every 30 miles down the road. For use of this application without wifi I recommend you have the 3G iPhone as the regular iphone’s Edge network is limited to how fast it can receive data leaving awkward buffering silences in the middle of the solo for “Don’t Stop Believing”. Got coal in your stocking? Not happy with your festive sweater or that beautiful tie that you’ve always wanted? Don’t sweat it, Santa delivered a bunch of free iPhone apps - just in time for Christmas. Easy Shake – Do you want to have a band or training your sense of tempo ? There are 6 sound effect with Easy Shake. Hold your iPhone and press one of it. Follow the background music and shake your iPhone! Classic Memo – Simple classic audio recorder with very basic functions with attractive interface! and let’s you change wallpaper! Tankcheck – With these program you can check the prices of petrol stations in - Germany - France - Belgium - Netherlands - Switzerland - Austria - Luxembourg You can check it with you postcode. Weather: Zero configuration! – Weather application does what it claims: it shows current weather and 4 days forecast for exact point where you are. Crossbones – Crossbones is a challenging and addictive pirate-themed puzzle game. Match cards as fast as you can to collect pirate loot. Play solo or against computer opponents. I f you would like to watch TV shows and independent bands on your iPhone, Joost's free iPhone app is for you. Joost allows you watch TV shows from CBS, Comedy Central, Warner Bros. and Sony at no charge over a Wi-Fi connection. Joost is one of the most popular iPhone applications noted USA Today. Similar to Joost.com Joost on the iPhone is ad-supported and free for users. "Offering Joost on the iPhone and iPod touch is an important step for Joost as we endeavor to offer users premium entertainment, where they want it and when they want it," said Mike Volpi, CEO of Joost. The iPod touch and iPhone are typically considered to be twins with the obvious exception that the touch lacks the phone hardware. Games and applications for the iPhone are usually able to play on the iPod touch as well. Thomas Fessler, CEO of Handheld Games Corp., says that the 3D performance between the platforms is far from the same, according to Touch Arcade. TouchSport Tennis from the company is one of the most demanding game titles for the platform and according to Fessler; the performance of the game is very different between the iPod touch and iPhone. Significant performance differences are seen between the generations of the touch device and iPhone as well. Fessler says that his company had to modify its game to run well across all platforms and that the 2G iPod touch is by far the highest performing platform for mobile gaming from Apple. 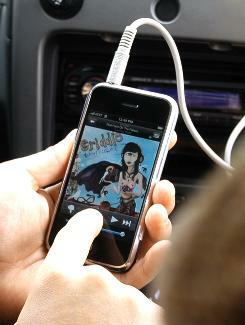 Englewood, CO (PRWEB) December 18, 2008 -- Los Angeles artist Anji Bee, known for her smooth vocals and music podcasts, can now be heard whenever someone calls you on your iPhone. She is featured on the latest set of ringtones from MacMost.com, the Mac news, tutorial and iPhone content Web site. MacMost began providing free iPhone ringtones earlier in 2008 as an alternative to pay-per-song downloads at the iTunes music store or illegal music downloads elsewhere. There are now 15 sets of ringtones in the MacMost collection. They feature everything from holiday sounds to short, original musical creations. "We began creating ringtones to fill a need," said Gary Rosenzweig, the producer of MacMost.com. "There are plenty of ringtones out there that you can buy, but we thought it was ridiculous to pay more for a ringtone that you would pay for a full song." The MacMost collection of more than 150 ringtones is available at the MacMost iPhone Ringtones (http://macmost.com/iphoneringtones/) section. You can also subscribe to it as a podcast at the iTunes Music Store for free. "One of the ideas we had for the free ringtones was to use them to promote artists," said Rosenzweig. "We knew Anji Bee from her work as a podcaster and thought it would be perfect to begin with her." The ringtone set features sections of Anji's work with various other artists, as well as her podcast theme and vocal recorded specifically for the ringtone set. Anji hosts The Chillcast, a weekly podcast that presents a smooth mix of electronica, jazz, soul, and world music each week. She is also the vocalist and lyricist for Lovespirals, who have produced several full-length albums and have been featured internationally on network and cable television including: MTV, Vh1, ETV, The WB/CW Network, and The Oprah Winfrey Show. You can find all of Anji Bee's projects at anjibee.com (http://anjibee.com). Microsoft apparently has “deep” feelings towards the iPhone (or Apple), as the company behind the Windows OS has released a free iPhone app, and a cool one at that. Immediately available for download from the iTunes App Store, Seadragon Mobile lets iPhone and iPod touch users zoom in as deep as possible on high quality images with near zero transition times. Microsoft's app makes it possible for users to “browse large quantities of high-resolution imagery smoothly and quickly with a flick or a pinch,” according to the iTunes App Store description. “Explore massive galaxies, pore over maps, or flip through collections of photographs, all over the air,” says the Windows maker. You can also add your own photos, or browse some that are already available on the official Photosynth website. For example, you can grab a picture of Times Square at night and try to spot anyone who might have been picking their nose at the time the photo was taken. The app's main features, as Microsoft points out, include the ability to view thousands of images over the air, view massive gigapixel pictures, explore Photosynth collections in 2D (including your own), add your own PhotoZoom / Deep Zoom Composer content, and even an RSS feed service. Apple has tweaked the App Store in response to unrest at how the store presents its wares. The App Store now spotlights the most popular applications on each category page, separating the most popular free apps from premium apps. The overall layout has also been adjusted to mimic the design of the App Store application on the iPhone itself. There's been a growing tide of criticism of the store, which has become a victim of its success. The proliferation of cheap and free iPhone apps - necessary to get visibility on the site - is perceived to be suppressing the development of quality premium products. While most cell phone service providers are willing to sell you just about any mobile phone without forcing you to sign a contract, this was not the case when the Apple iPhone 3G arrived in Canada. In order to get your hands on the latest Cupertino hotness, you had to latch yourself down to a new three-year service agreement with either Rogers Wireless or Fido. The three-year contract may have been a major hurdle for some people, but it seems that it just may be possible to pick up the iPhone 3G without having to sign a new agreement. How? We’ll have to take this with a great deal of hesitation, but on the Future Shop website last night, they were listing the iPhone 3G from Rogers with some rather interesting price points. The Apple iPhone isn't just pretty, it's useful, too. One of its coolest features is that it can be customized with hundreds of free Web applications. These applications allow you to check in on your favorite social-networking sites, receive RSS (Really Simple Syndication) news feeds, watch videos and play games -- all on an interface that's made for the iPhone and iPod Touch. iPhone users can take advantage of several free applications. See more iPhone pictures. Web applications, also known as Web apps, don't require any special software downloads. Since they're Web-based, they're accessible through the iPhone's Safari Web browser. Simply type in the application's URL, and you're there. If you like a Web app, you can easily add an icon to your iPhone home page for easy, one-click access. The killer app for the iPhone is — drum roll, please — the iTunes App Store. Five months after Apple launched its online emporium, I believe it even more, having downloaded a gaggle of programs, including some that transform my iPhone 3G into a harmonica, metric system converter and level. There are now more than 10,000 of these applications for the original iPhone, its 3G successor and in most cases, for the iPod Touch. Many are free. I encounter buggy programs from time to time, but there are frequent updates to fix such snags. And because of the drain on the battery, Apple still won't let developers produce apps that run in the background. So forget about listening to Internet radio while checking e-mail. I'm also waiting on an app that will let you shoot video. Apple has shown terrific growth over the past decade after virtually collapsing in the early 90s. However, one segment that it has never really been able to win back is the business sector. Not since the days of Apple IIe's or further back has Apple really enjoyed strong business adoption. And the business sector, consisting of everything from business laptops, to servers and business phones, is a huge revenue source so this was a big loss for Apple. However, Apple's hottest gadget, the iPhone is finally starting to win Apple a following in the business community. App Store starts with 500 applications online a few months ago, the number of applications in App Store grow rapidly and reached 10000 applications! The 10000 applications include paid applications and free applications. Meanwhile, we like FREE things, free apps are more attractive than the paid apps. The questions is, how can we find the good free apps among the 10000 apps on App Store. Luckily, based on the number of downloads, we can come up with a list of the Top 100 Free iPhone Apps. Your Own Free iPhone Via A Free iPod Touch? Okay, while the concept of Truphone for the iPod touch is hardly going to replace my own mobile device for placing phone calls, the idea is not half bad. 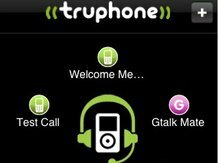 Apparently not all of the pieces of this puzzle are out yet, as Truphone is waiting to release the needed microphone before this becomes usable. That said, it does seem to have some obvious limitations. First, while the user is able to skip out on mobile call charges or a need for a mobile phone at all, the thought of people congregating around a router is just stupid, especially if they are waiting for an incoming call. Secondly, it is not really all that free. Think of Skype’s business model, but with an iPod touch - essentially this is what Truphone is pulling off here. Every December, the rumor mills begin to churn with speculation about what Apple will reveal at January's Macworld Expo. The first scintillating scuttlebutt of this year's rumor season, however, focuses not on Steve's traditional "And one more thing..." but instead on Wal-Mart's possible revival of the 4GB iPhone. The Boy Genius Report — the self-styled "crowd favorite within the circles of the online gadget communities" — first reported back in October that The Destroyer of Small-Town America, aka Wal-Mart, would join Best Buy as a mass-market distributor of the iPhone 3G. Today comes news that the Brainiac Laddie has refined his prognostictions with the assertion that not only is the iPhone on its way to the big-box retailer, but that a $99 4GB model will be in the mix, offered at that price with a two-year contract. Saw a picture of this funny iPhone mod over at Engadget. Hope the barf bag is unused! Amazon.com on Tuesday announced the release of an application designed to work on the iPhone and iPod touch. It's available for free download from the App Store. The new application helps users search and browse for products offered by Amazon.com and associated retailers including Target and Macy's. Customer reviews can be viewed using the app, and transactions can be completed using Amazon.com's "1-Click Shopping" and through the "Amazon Prime" premium shipping service.